It is November 1941. The world is an uncertain place. War is spreading, and the big question is when the United States will enter the fray. Eva Cassidy has just enlisted in the Army Nurse Corps and is headed to Hawaii on a luxury liner. She leaves behind a tarnished professional reputation and is anxious to begin her new career and reconnect with her boyfriend, Billy, who is stationed in Hawaii. On the luxury steamship SS Lurline, Eva meets Lt. Clark Spencer, an enigmatic navy intelligence officer with secrets of his own. During the cruise, Eva and Clark become interested in each other, but it seems that their paths may not cross once the ship docks. The first third of Sara Ackerman’s novel deals with life on board the ship. Eva fails to tell Clark about Billy. And Clark is quite preoccupied with mysterious radio transmissions and tersely opines that it is possible the Japanese are planning an attack. 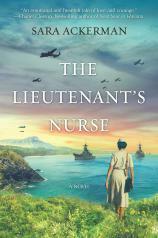 "For readers who enjoy historical fiction of the WWII era and a complicated romantic novel, THE LIEUTENANT’S NURSE certainly ticks those boxes." Once at Pearl Harbor, Eva is just settling into her new billet, getting acquainted with her fellow nurses and reacquainted with Billy. Then the unthinkable happens. The Japanese do attack Pearl Harbor, leaving tragedy and disaster in their wake. Eva and the other nurses have never experienced human misery on such a large scale. They are short on critical medical supplies and safe, hygienic spaces to care for the vast number of severely injured patients. Working conditions are deplorable. Still, they manage to calm their own fears and tend to their patients. Peaceful and tropical Pearl Harbor ceases to exist. It has been replaced by the horrors and reality of war. Things are not as they seem on the surface. Billy is hardly the man Eva thought she knew. A very seriously injured Clark has vanished from the hospital, even though he was too frail to leave of his own accord. And who are the two men in suits who seemed to appear out of the ether? Now the book becomes a mystery, picking up tempo with startling speed toward the unexpected conclusion. For readers who enjoy historical fiction of the WWII era and a complicated romantic novel, THE LIEUTENANT’S NURSE certainly ticks those boxes.